Dhaka, 13 Mar, Abnews: Recordings show apparent confusion between the pilot and air traffic control over the runway approach at Kathmandu airport as Nepal Tuesday began investigating its deadliest plane crash in decades. 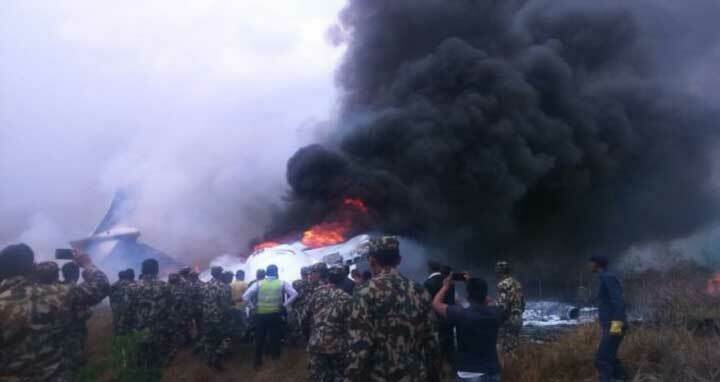 Aviation authorities said they had recovered the flight data recorder from the charred wreckage of the plane, which burst into flames after crashing into a football field near Kathmandu airport on Monday killing 49 people. On Monday the airline's chief executive Imran Asif said there had been a "fumble from the control tower" as the plane approached the airport's single runway. But airport manager Raj Kumar Chhetri told AFP it was too early to say what had caused the mountainous country's deadliest crash since 1992. "It is yet to be identified whether the pilot or air traffic control was wrong," he said, adding the investigation would be carried out with Bangladesh. "You are going towards runway 20," the controller is heard saying seconds later, referring to the northern end of the tarmac. A series of confused messages follow just before the crash in which the pilot says they will land at "runway 20" and then "runway 02" -- the southern end. "There is certainly considerable confusion from air traffic as to which runway the aircraft actually wants to land on," said Britain-based aviation expert Andrew Blackie, who has reviewed the recordings. Survivors told AFP the pilot gave no warnings as the plane abruptly changed direction. Twenty-two passengers -- mostly sitting on the plane's right side -- managed to free themselves from burning wreckage by climbing through the plane's windows or were pulled from the fuselage by passengers and rescuers. "There are reasons why Nepal has such a relatively high accident rate, many of those are because of the challenges of operating in mountain airfields that surround Nepal," said Blackie, who was part of an team that probed a 2016 crash of a small turboprop plane in Nepal.